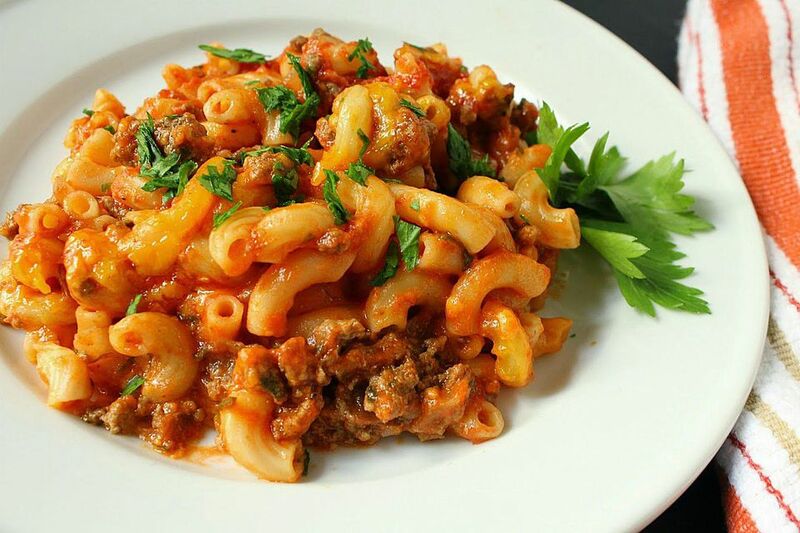 One of the great casserole recipes of all time is the ground beef, tomato, and elbow macaroni dish that goes by the name Johnny Marzetti. It was made famous by the Marzetti Restaurant in Columbus, Ohio, during the 1920s and named after owner Theresa Marzetti's brother-in-law. Many Midwestern families have enjoyed this legendary casserole for generations. It may not be fancy, but it is the ideal comfort food for fall and winter, the recipe is easy to follow, and it serves a crowd. If there are any leftovers (which is rare! ), they are even more delicious the next day. Bring a large pot of salted water to a boil and add the elbow macaroni. Cook until al dente (between 10 and 12 minutes). Drain well. Return the macaroni to the pot and toss with 1 teaspoon of oil to prevent the noodles from sticking together. Gather the minced garlic into a small pile on a cutting board and sprinkle it with kosher salt. Using a chef's knife, press down on the salt and grind it with the garlic to form a coarse paste. Set aside. In a large skillet, heat the 2 tablespoons oil over medium-high heat. Sauté the onion for 5 minutes, until softened. Add the celery and sliced mushrooms. Sauté for 5 to 7 minutes or until the mushrooms are releasing their juices. Stir in the ground beef, breaking it up, and cook until browned with no pink remaining. Add the red wine and deglaze the skillet, allowing the wine to cook down and evaporate, about 5 minutes. Preheat the oven to 350 F. Grease a large baking dish with butter. Squeezing through your fingers, add the tomatoes and their juices to the beef mixture. Stir in the garlic paste, several grinds of black pepper, oregano, and basil. Transfer the meat and tomatoes to the pot with the cooked macaroni, and combine with all but 1 cup of the grated cheddar cheese. Transfer everything to the buttered baking dish and sprinkle the remaining 1 cup cheddar cheese on top. Bake uncovered 35 to 40 minutes until the casserole is bubbling and the cheese is nicely browned on top. Wait 10 minutes for the casserole to settle, then serve.